If you’ve been following along on the Instagram you will know I have been spending a little time in Johannesburg. If you haven’t been following along and would like to do so you can find me over here! I am a Cape Town based food blogger who is going to be spending three months of this year in Johannesburg. Work has sent me up on an amazing opportunity and I have decided to treat Jo’burg like an adventure. And like all adventures – I’m probably going to blog about it. I wondered if my Cape Town readers would think I was wasting their time. That maybe they’re not interested in Jo’burg. But I think Jo’burg is pretty cool and I have found some INCREDIBLE restaurants so I’m going to be sharing them! What the big Jo’burg adventure meant was research. Guys, I am such a nerd! It is really embarassing! I love to google, I love reading reviews, food blogs and anything else I can get my hands on. I am working really hard at the moment (We all are, I’m not special) so I decided to treat Jo’burg like a mini holiday. All my Jo’burg research paid off and we tried out some amazing restaurants! 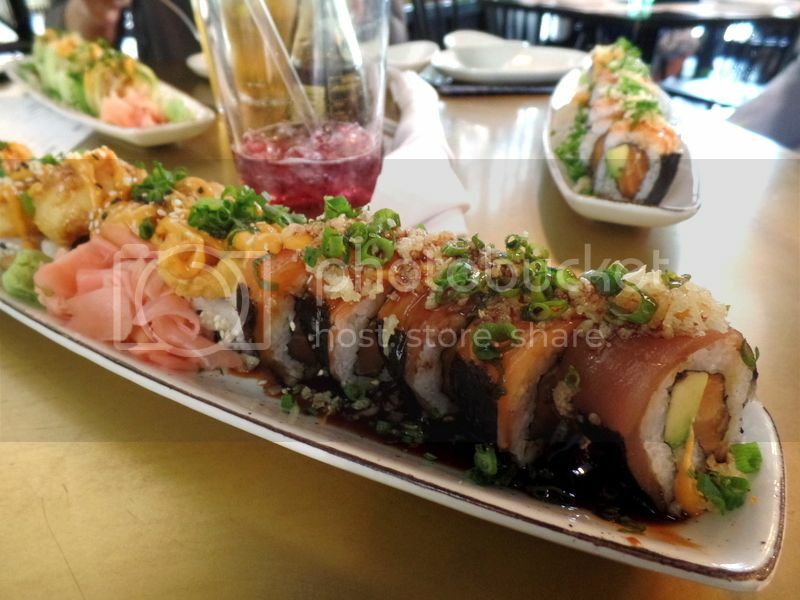 However, I had to start the Jo’burg posts with my favourite City of Gold sushi Spot! 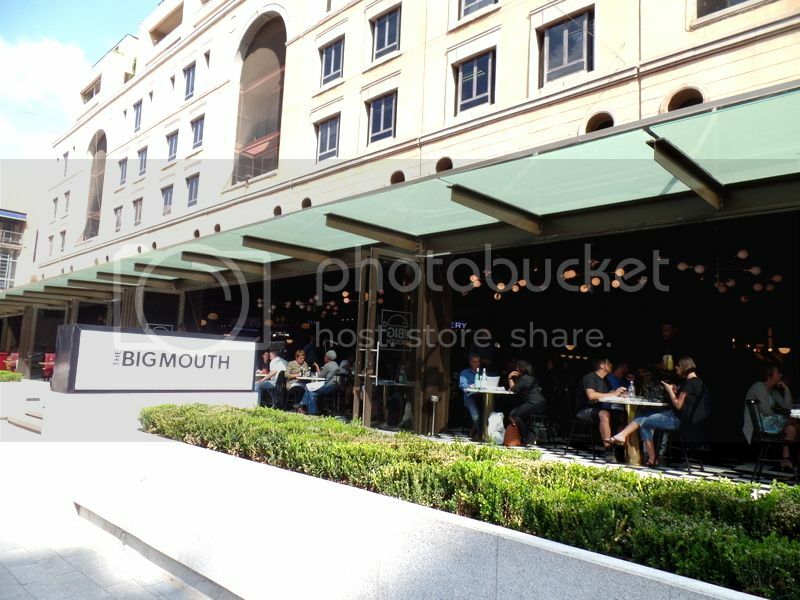 The Big Mouth can be found in Nelson Mandela Square in Sandton which is in walking distance of both our hotel and where we are working. This is part of the reason why we have visited twice in five weeks. The main reason is because it is so flipping delicious and I am constantly craving sushi! Our first visit was a Wednesday night and despite the school night every table in the restaurant was full and we had to book! Our next visit was a public holiday lunch and again with the full tables! 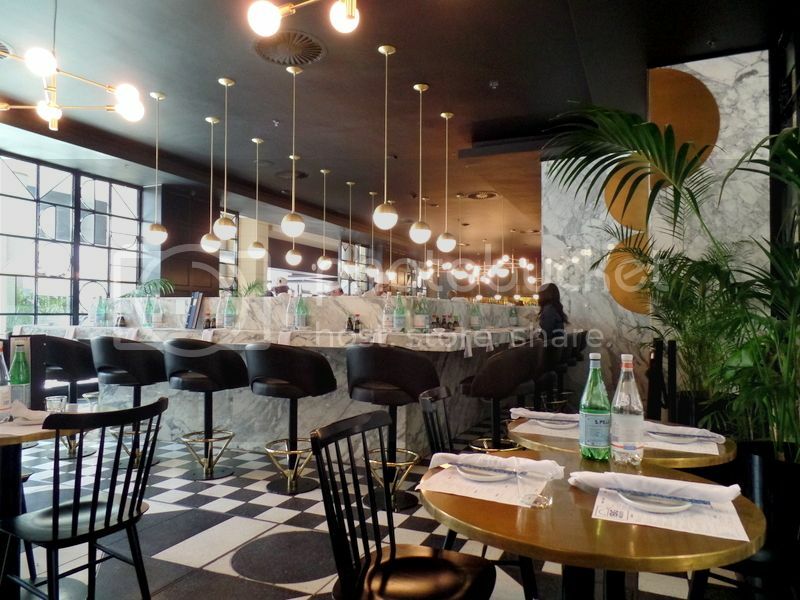 They have a huge menu offering from fresh salads, seafood, steaks, grills, tacos, small plates and sushi. You would think with such a huge menu offering they’re bound to drop the ball. They don’t- the food is flawless. The service is a little hit and miss and they aren’t particularly interested but I can see passed that for the sake of the food! With two visits, and an understanding that if your order differs from mine I will be tasting it, I have managed to try a fair amount of the sushi offerings. My favourite choices are the SUV ten pieces and the four pieces of crispy rice. The SUV is the sushi featured in the very top two pieces. It is like the 5×5 from Willoughby’s and just as good. Yes, I actually said that. Jo’burg has sushi game. The SUV is made up of five rainbow reloaded rolls and 5 salmon California rolls topped with creamy shrimp tempura! On my first visit I went with the straight out 10 piece rainbow reloaded rolls and they were sensational! The fresh salmon, tuna and avo combo topped with teriyaki, sesame oil, mayo, seven spices, spring onions and caviar is a big winner. And again – just as good as Willoughby’s. Willoughby’s, in my opinion, knocks out the best rainbow reloaded rolls in Cape Town – I was delighted to find their Jo’burg contemporary! The other half of the SUV combo can boast the freshest salmon and avo filled California rolls topped with lightly tempura’ed giant prawns drizzled in creamy rich mayo! I am craving these as I type the words! 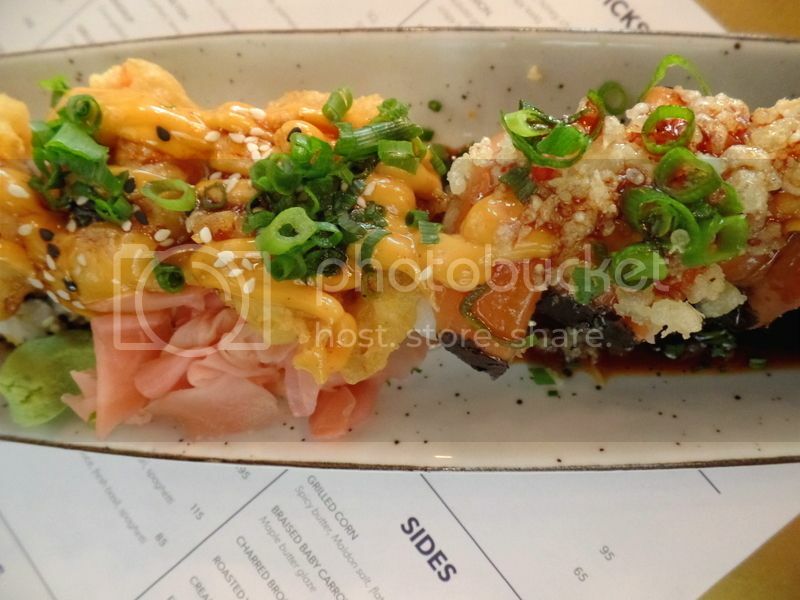 The Big Mouth creates some inventive sushi dishes! One I am excited to try soon is the fish and chip roll of crispy hake, pickled radish and avocado California rolls topped with spicy mayo, mini potato crisps and peas! Whilst I wasn’t quite up for this crazy dish last time we did branch out and try the Crispy Rice. And the cripsy rice is delicious!! 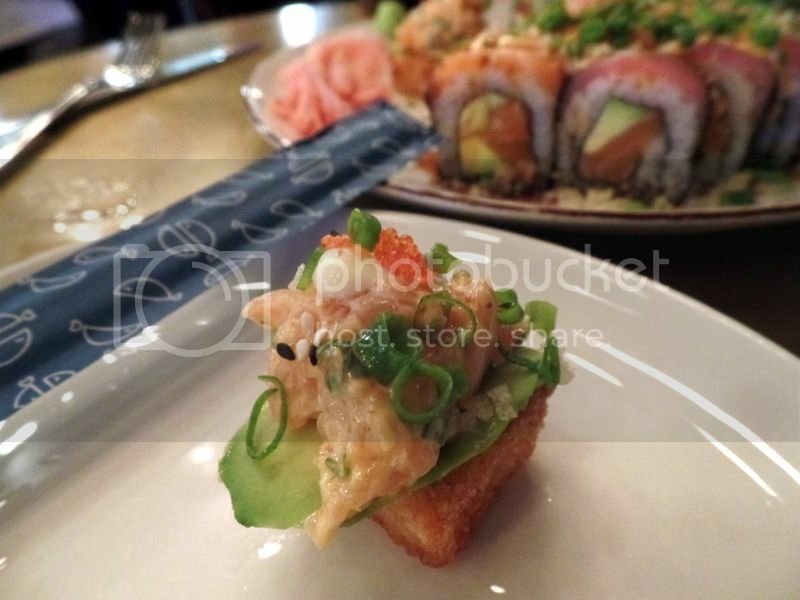 They are little crispy rice squares topped with spicy salmon, avocade, caviar, soya and sesame oil. The rice is dense and delicious with a crispy outer layer and topped with the creamiest richest salmon! These little rice squares are a perfect sushi treat – almost like a dessert to finish off! 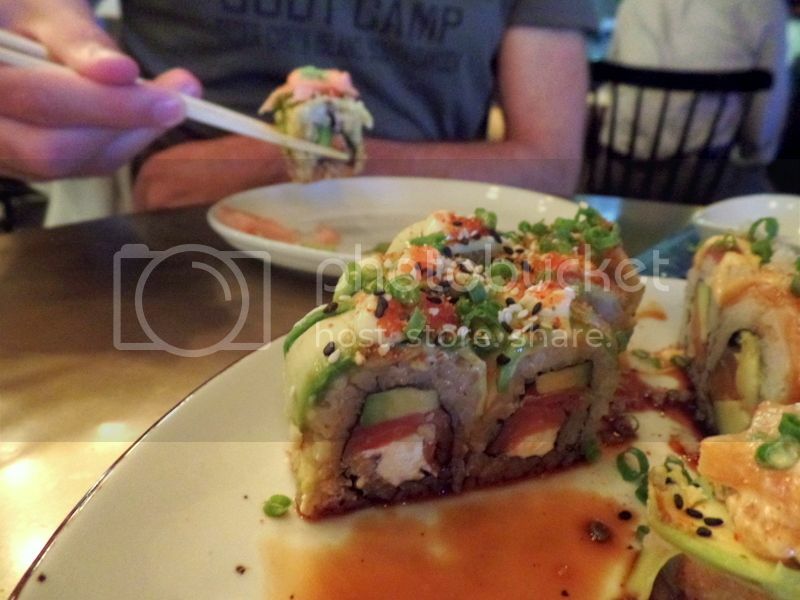 Other great dishes we tried include the Philadelphia roll and the Bamboo roll. 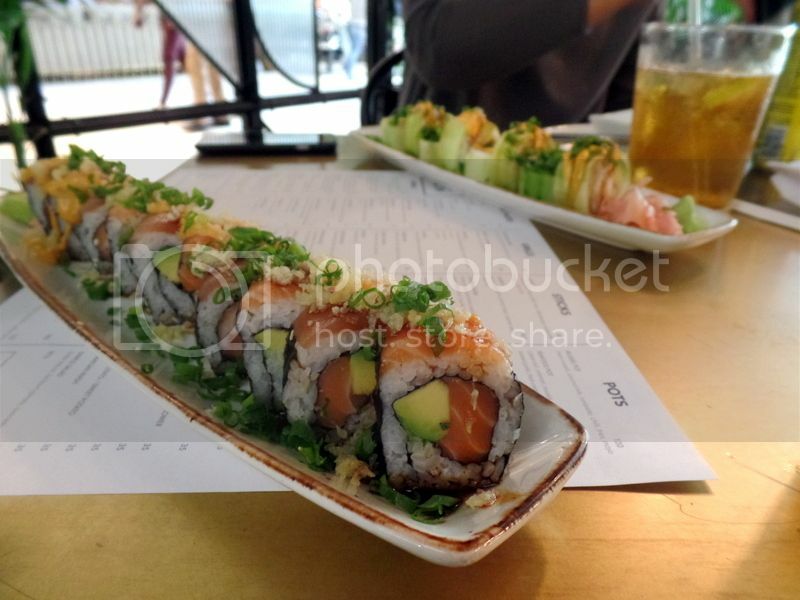 The Philadelphia roll is a California roll with cream cheese and smoked salmon and topped with avocado, teriyaki, spring onions and Japanese mayo. Whilst this was really delicious I tend to prefer my salmon raw and to skip the cream cheese. Despite my normal no cream cheese rule this was one of the better versions. My dinner partner even said that the sushi had so much flavour you could skip the soya sauce – and he was spot on! 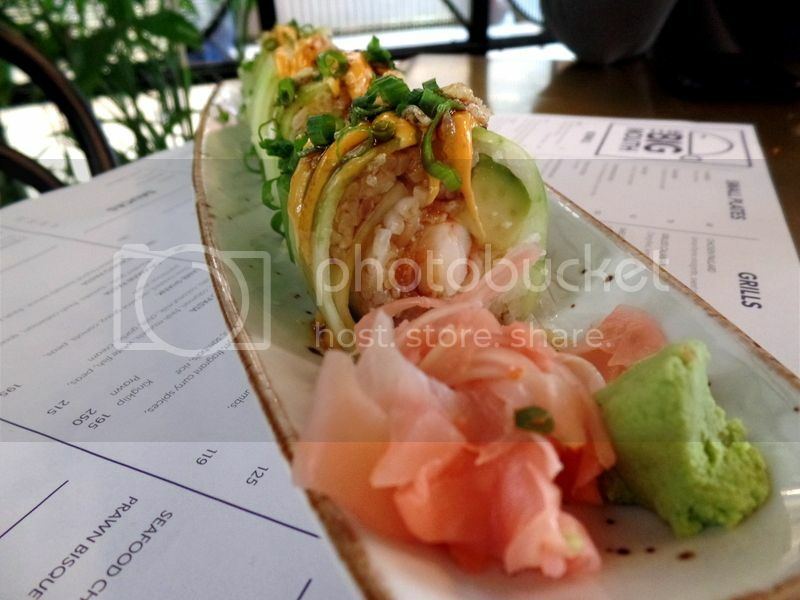 The bamboo roll was another stand out choice! 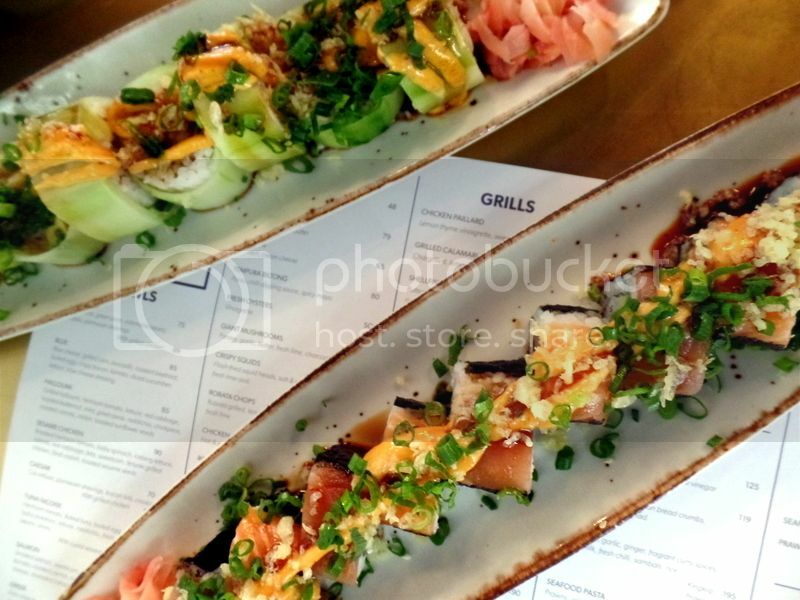 The standard bamboo roll is a cucumber wrapped avocado and salmon roll reloaded style. However, one of our lunch guests prefers prawns and they were happy to swap out the salmon for tempura prawns. I thought they were totally going to mess up the order but it arrived with juicey tempura’ed prawns! The fresh cucumber outside with the crispy prawns was a serious power couple! I might actually order the bamboo roll with the tempura prawns going forward as it was such a fantastic combination! 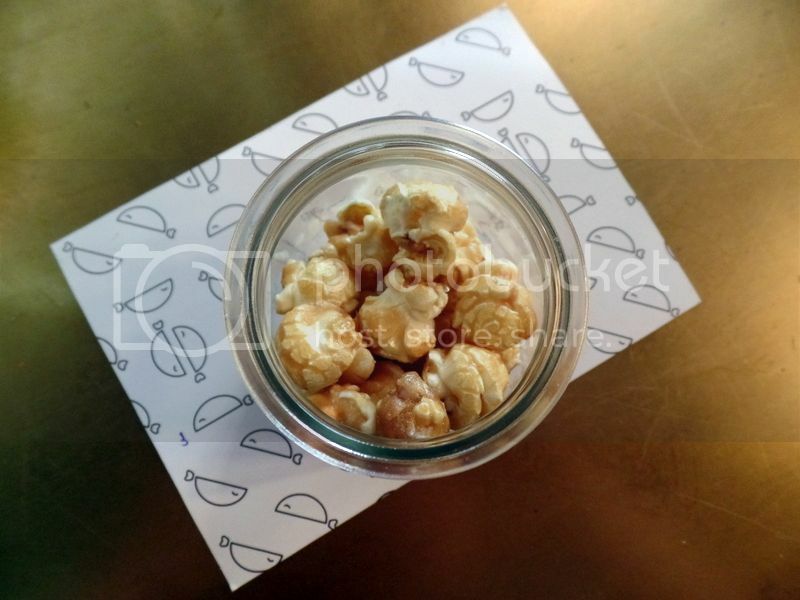 I also loved the sweet finish of caramelised popcorn which arrives with the bill – little touches always go a long way! 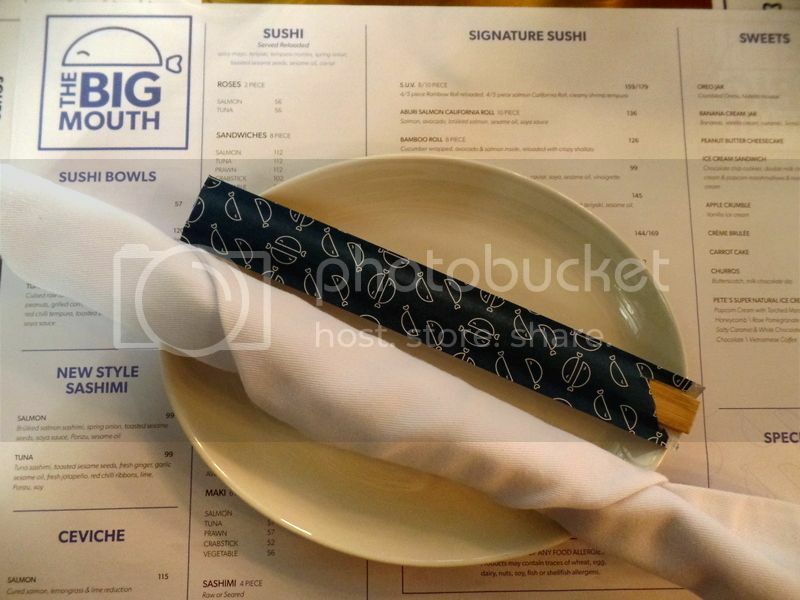 We seriously enjoyed our visits to The Big Mouth and I am delighted to have found a sushi gem in Jo’burg for our next trip up! Where are you favourite spots for sushi in Cape Town or Johannesburg?